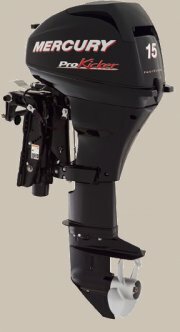 The 15hp Mercury ProKicker features a compact, integrated power tilt and a heavy-duty transom bracket for maximum strength, speed and durability. Additionally the 15hp ProKicker sports an updated graphics package designed to compliment the OptiMax Pro XS and Verado outboards. 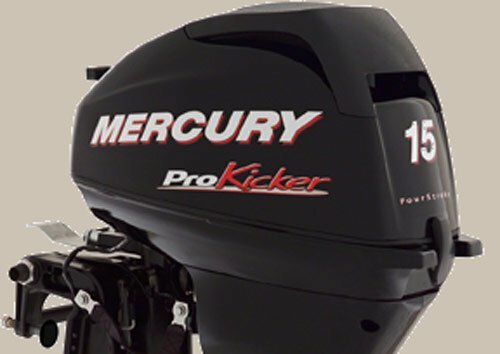 Installed next to a Pro XS or Verado outboard, the improved ProKicker graphics will make your rig stand out from the rest of the pack. Patented Centering Straps. Holds the engine straight without additional hold-downs when running in the rough conditions or trailering (Standard on Tiller Pro Kickers).